Magnum E-cigarettes are electronic vaporizers that were developed as a healthier alternative to smoking cigarettes. Instead of producing smoke, they produce water vapor which can be inhaled in a similar manner to regular cigarettes. Magnum is a brand of realistic e-cigs from Epuffer. They are thin, sleek, and look like regular cigarettes from afar. Most varieties offer an authentic smoking experience because of their ease of use and lightweight build. They produce a satisfying amount of visible vapor and the tip even lights up whenever you inhale, completing the illusion that you are smoking an actual cigarette. Piqued your curiosity? You can buy one right here. Why should you switch to Magnum Snaps ecigs? E-cigs are by far a much healthier alternative to smoking cigarettes because they limit the amount of smoke that you inhale. Smoke inhalation is one of the major factors that increase your chances of developing throat and lung cancers. With electronic cigarettes, you only inhale water vapor, which can be flavored or tasteless depending on your preferences. E-cigarettes also can be used as tools to quit smoking in the long run, as it helps curb nicotine cravings. You can purchase e-juice that comes with successively less nicotine – there are cartomizers available that are completely nicotine free. What is the difference between E-cigarettes and Vape Pens? Unlike Vape pens, electronic cigarettes are much smaller and emulate the appearance of real cigarettes. Vape pens on the other hand, are larger devices and usually look like long, tube shaped contraptions. 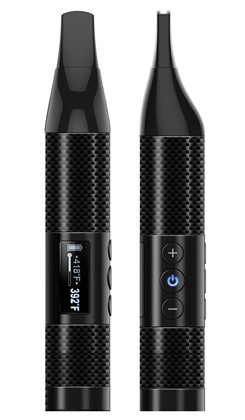 They have a separate battery, heating device, e-juice reservoir or tank, and a mouth piece. They are typically very customizable as you can easily mix and match the components and screw them together as needed. To refill your pens with vape juice, you must buy bottles of the liquid and use a dropper to refill it as needed. There are many flavors to choose from. E-cigs are less customizable because they are small and compact. They have fewer components and typically can be bought in e-cig starter kits. Instead of using refillable vape tanks as with the pens, you use disposable cartomizers, which also doubles as your mouthpiece. As they are the size of a regular cigarette, it is lightweight and much easier to use. E-cigs are perfect for beginners, because they have the same look and feel as the real thing. This is a good option for those who feel overwhelmed with the many components of vape pens. Some people also choose e-cigs because they dislike the size and the bulk of most vape pens and would prefer something much smaller and more portable. Another thing to note is that since the cartomizers are disposable, it is also much easier to maintain an e cig. You do not have to regularly clean out a mouthpiece and vaping tank. How do you use an ecig? E-cigs are extremely easy to use. When buying a starter-kit, you typically receive one or two e-cig batteries, a USB charger, a set of cartomizers, a universal adapter, and a short instruction manual. Depending on the Magnum kit that you purchase, you can get other items as well. When you receive your e-cig, you must first charge the batteries using the USB charger. 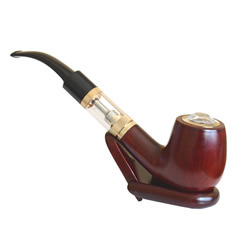 After it has fully charged, you screw or snap in the cartomizer, and then puff as you would a normal cigarette. It automatically detects that you are inhaling and starts to produce vapor. How does a Magnum Snaps eCigarette work? An e-cig is a very sophisticated piece of technology. The main part of the e-cigarette (where the tobacco typically would be in a regular cigarette), is the battery. On one end of the battery, you have a small heating device which evaporates the fluid in the cartomizer, while the other end holds a bulb which lights up to produce the illusion that it is burning. The cartomizer houses the e liquid, which is what creates the vapor. Since water vapor is mostly colorless, manufacturers add either propylene or vegetable glycerine to produce a more realistic smoke-like effect. Flavorings are also added to complete the experience. Most Magnum Ecigs will have a microprocessor that detects the flow of air, so it starts heating up the vape fluid automatically as soon as you inhale. 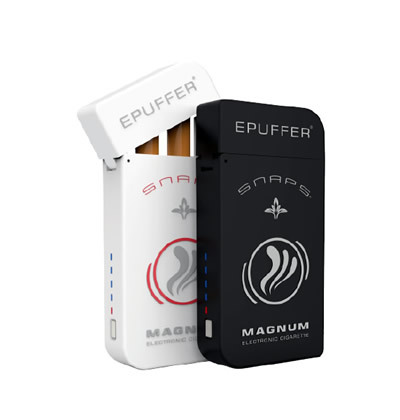 What are the benefits of using a Magnum Snaps E-cig? Along with its ease of use, Magnum ecigs are exceptionally safe. It can help you quit smoking by reducing your nicotine intake, which can help you stop smoking completely. Magnum e-cigs are also much safer than conventional cigarettes because they do not pose a fire hazard. It is virtually impossible for you to get burned with it, and it will not catch fire to your clothes and furniture. Maintenance is extremely easy, as mouthpieces are disposable and will not require cleaning – you simply dispose of the cartridge after use. A Magnum e-cig is also very lightweight and fits in your pocket. This makes it both conveniently hygienic and portable. It also lasts much longer than a regular cigarette as one cartomizer can hold up to 300 to 400 puffs. One cartridge is equivalent to roughly 30 cigarettes. It will take you a long time before you need to have it replaced with a new cartridge. What flavors are available for Magnum Snaps cartomizers? When you purchase an e-cigarette, you get a wider range of flavors than regular cigarettes. Popular flavors include tobacco and menthol, but more unusual combinations are available as well. You can also purchase blank cartomizers which have to be manually filled with e-juice. You can choose from a whole slew of different vape flavors, ranging from herbal to fruity. You can even choose to mix flavors for a completely new vaping experience. Where can you buy a Magnum Snaps E-Cigarette? 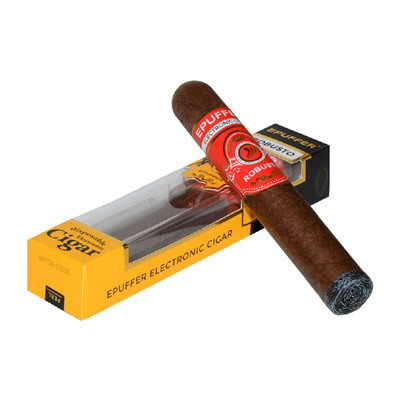 You can purchase a Magnum e cigarette online from the ePuffer website. We have various starter-kits available in multiple styles. We also sell cartomizers in different grades and flavors, ranging from regular to premium varieties. Alternatively, you can try various vaping specialty shops within your area. You can call ahead to ask if they have Magnum Snaps available, and you can also compare it with other brands at a glance.